Description: This train was on the main but craaaaaaaaaawling along. Description: I like these units, they have those MLW-Style trucks. Description: Southbound below hex signals. Description: 2 different cowl units! Description: Q620 heads south past farmland on this pleasent day. 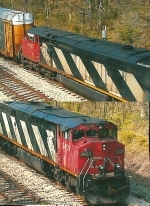 Description: A pair of CN widebodies lean into the banked curve at QM 127 with a 115 car train in tow. Description: Q620 at QM 97. Description: Going away shot of L506 with four units, been a while since this much power has been this way. Description: CN 2427 brings his train past the Homewood railfan park on his way to work Markham Yard. Description: CN 2427 up close.